Pile radish slices into a strainer and sprinkle salt on top. Toss to combine and let sit 30 minutes until 1-2 tablespoons of water is released. While waiting on radishes to drain, add rice wine vinegar, apple cider vinegar, black pepper, white sugar and soy sauce to a mixing bowl. whisk to mix. 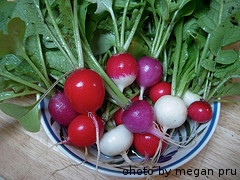 Rinse radishes several times to remove as much salt as possible. Place in mixing bowl and stir to coat. Cover and place in refrigerator for 2 days, stirring twice. Best served cold. Melt butter in saute pan over medium heat. Add radishes and garlic and saute for 10 minutes over medium heat. Remove from heat and add parsley and toss to combine. Season with salt and pepper and serve immediately. Melt the butter in a large saucepan over medium heat. Add the onion and saute until nearly tender. Add the garlic and saute another 3 minutes. Add the potatoes, radish tops and carrot and toss to coat. Pour in chicken broth and bring to a boil. Reduce heat and simmer 30 minutes. Remove from heat and allow to cool for 10 minutes. Transfer mixture into a blender. Blend until smooth. Return mixture to saucepan over medium heat. Mix in cream and cook and stir until well-blended and heated through. Serve with crusty bread. Place green beans in large saucepan and cover with water. Bring to a simmer and cook for 10 minutes or until crisp-tender. Drain and set aside. In a skillet, melt butter over medium heat and add onions. Cook until just tender. Add lemon juice and soy sauce and mix to combine. Add beans to onion mixture and toss to coat. Heat beans through and finish by sprinkling radishes and almonds over the top. Serve immediately. Whisk shallot, mustard, rice wine vinegar, red wine vinegar and radishes together in a bowl. Slowly whisk in oil in a steady stream to form a thick dressing. Use immediately or can keep covered at room temperature and held for several hours until ready to use.